Two routes of administration may be used for allergen immunotherapy: subcutaneous injection or oromucosal / sublingual. The subcutaneous route has been in use in humans and animals for more than 50 years. After an initial up-dosing schedule, maintenance injections are typically given every one to two weeks. The sublingual route has been gaining favor in Europe for the past 15 years in human allergy practice. It is now the predominant route of administration in some countries. Numerous high quality studies have demonstrated that sublingual immunotherapy reduces symptoms and the need for medications without adverse effects.1 The degree of benefit is similar to that obtained with subcutaneous IT. One of the primary functions of the mucosal immune system is to develop tolerance of foreign proteins that we (or our patients) ingest. The sublingual and buccal mucosa provide access to the privileged immune system of the oral cavity to induce environmental allergen tolerance. The plentiful dendritic cells in the mucosa process antigens and present them to T-cells, which go on to modulate cytokines including IL-10 and TGF-β. The oral mucosa displays unique immunological features which make it an attractive target for immunotherapy. Several companies now offer oromucosal immunotherapy for dogs in the United States. My company, SkinVet®, offers regionally-specific immunotherapy (RESPIT®), in a pediatric spray device for daily administration in the cheek of dogs. Allergy testing need not be performed first, as the allergens are standardized to the geographic region. (Read some of my previous posts to learn why I don’t ask my clients to spend their money on allergy testing). The build-up dosing schedule common to injection immunotherapy is not needed for RESPIT® Oromucosal Spray therapy, because of the wide margin of safety. Two reports on oral immunotherapy in dogs were presented at the 2012 World Congress of Veterinary Dermatology in Vancouver, B.C. In a laboratory model of canine atopic dermatitis, the clinical effect of allergen challenge in sensitized dogs was diminished after treatment with oromucosal spray immunotherapy.2 Corresponding cytokine changes were demonstrated in this University of Florida study. 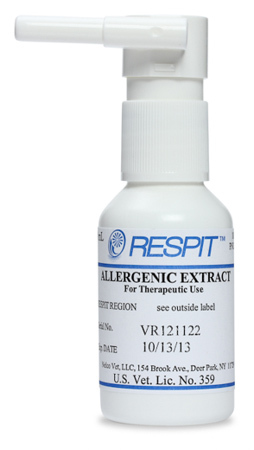 The customized allergen extracts evaluated were produced by Nelco Vet, the manufacturer of RESPIT®. It is sold under the name AllerPaws. A third product is offered by Heska. A large, uncontrolled case series by Doug Deboer found clinical improvement and potentially meaningful changes in allergen-specific IgE and IgG in SLIT-treated dogs.2 The cases were enrolled by numerous veterinary dermatologists and extracts were customized based on the testing method of their choosing. Few details were presented regarding the testing actually used, but these presumably included intradermal testing with various techniques and serum IgE testing by various laboratories. Yet, despite the variability in testing methods, the overall efficacy of the ensuing SLIT was still promising, if not definitively proven in this uncontrolled study. The oromucosal spray or SLIT routes are nice options to have. That said, most of my clients still opt for once weekly injectable administration over daily oromucosal spray. 1 Radulovic S, Wilson D, Calderon M, et al. Systematic reviews of sublingual immunotherapy (SLIT). Allergy 2011;66:740-752. 2 Abstracts. Veterinary Dermatology 2012;23:2-104. Jon Plant, DVM, is a Diplomate of the American College of Veterinary Dermatology, founder of SkinVet Clinic and developer of RESPIT, regionally-specific immunotheray for atopic dermatitis of dogs and cats. He is a member of the International Committee on Atopic Diseases of Animals, the past President of the Portland Veterinary Medical Association and the Dermatology Section Editor of the Journal of the American Animal Hospital Association. This entry was posted in Atopic Dermatitis, immunotherapy, intradermal test, serum IgE test and tagged ASIT, atopic dermatits, dermatology, dog, pet, skin, veterinary, veterinary dermatology. Bookmark the permalink.